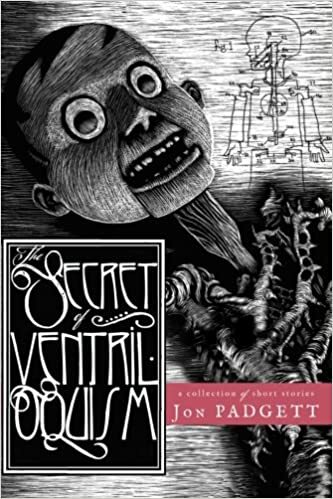 The Secret of Ventriloquism by Jon Padgett is a collection of interrelated short stories, as well as a play. It’s incredibly creepy. “20 Simple Steps to Ventriloquism” starts out by giving practical step-by-step advice on how to become a ventriloquist. However, it eventually speaks of Greater Ventriloquism in which the ventriloquist gains mastery over other people as if they too are puppets: “Just remind yourself that the ventriloquist dummy, your pets, your family and friends all have one thing in common with each other: they are dummies. With practice, you will be amazed at how they will dance to the tune of your voice.” This idea is expanded upon in the equally creepy play “The Secret of Ventriloquism”. “The Infusorium” is another creepy tale about a detective investigating strange elongated skeletons in a town with deadly pollution. What makes this especially horrifying is that it’s inspired by an actual event, the Donora, PA Smog of 1948 that killed about 20 people. “Organ Void” is a story full of phlegm, pus, diarrhea, and just overall nastiness. This one relies more on shock value than the more subtle creepiness of the rest of the collection. And finally, “Escape to Thin Mountain” is a horror version of the Big Rock Candy Mountain, a mystical place a group of homeless people are trying to get to. The narrator is first person plural, so I thought a community might be telling this story at first, but later I realized that it’s possible a person with multiple personalities is relating the story. I can’t remember the last time I read something that gave me the creeps like this did. The best description I can think of for this collection is just plain creepy. Recommended if that’s what you’re looking for.